FILE - Liberia's President Ellen Johnson Sirleaf speaks during a news conference at the Presidential Palace in Monrovia, Liberia, Oct. 12, 2017. Ellen Johnson Sirleaf, the former president of Liberia, has been awarded the $5 million Mo Ibrahim prize which recognizes excellence in African leadership. Johnson Sirleaf stepped down from office last month, the first democratic transition of power in Liberia since 1944. The Nobel Peace Prize laureate was Africa's first female elected head of state. She served two six-year terms, but was not eligible to run again for the office, according to Liberia's constitution. Dr. Salim Ahmed Salim, the chair of the prize committee said in announcing the award that Johnson Sirleaf "took the helm of Liberia when it was completely destroyed by civil war and led a process of reconciliation that focused on building a nation and its democratic institutions." 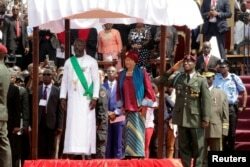 He added that "Such a journey cannot be without some shortcomings," but nevertheless Johnson Sirleaf "laid the foundations on which Liberia can now build." Linda Thomas-Greenfield, a former U.S. ambassador to Liberia, said Johnson Sirleaf "left the country in a much better state than she found it," adding there is "still a lot of work to be done." The Mo Ibrahim Foundation was founded by Sudanese telecom tycoon Mo Ibrahim who said upon learning that Johnson Sirleaf had been awarded the prize: "I am proud to see the first woman Ibrahim Laureate, and I hope Ellen Johnson Sirleaf will continue to inspire women in Africa and beyond." The $5 million prize is handed out over 10 years with another $200,000 annually throughout the winner's lifetime. James Butty contributed to this report.